Get creativity stuck in your head! What Was Charlie Parker Hearing? Despite the lofty title and its implications, this is not a full analysis of the thought processes of one the greatest players of Jazz. Instead, it serves as a placemarker for further discussion and thought. The explanation given was that he wasn’t dealing with the lower parts of the chord (read that as functional – 1 3 5 7) rather he was creating melodies using the upper parts of the chord (the extensions, 9 11 13). This all seemed feasible and even likely as Bebop was such a departure from the Swing music that preceded it. However, even a cursory examination of the melodies and solos by Mr. Parker showed that he didn’t seem to really discriminate. Yes, he did use these extensions and even as Steve Coleman explains, the upper structure triads that include these notes, it didn’t seem that this was the factor that set his melody writing apart. 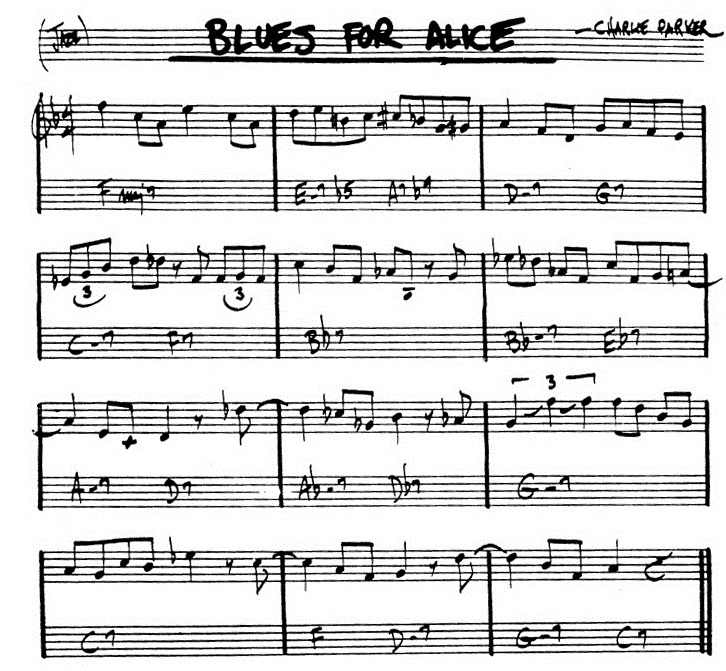 Analyzing the head to Blues for Alice was the lightbulb moment for me. I was isolating the voiceleading of the melody (the first 4 bars in Concert Key: F E D C# A G Eb Db C) when I remembered part of the quote “high notes of the chords as a melodic line” – and in this case, the voiceleading line was, for the most part, the highest note. They also featured arpeggios and scale notes that seemed to be “backing them with appropriately related changes“. Indeed, sometimes the notes that fell on beats 1 and 3 forming the voiceleading or structure of the melody were 9ths and other extensions. But for the most part, they were root notes, 7ths, 3rds, 5ths or altered 5ths. The view that I’m attempting to put across is that the normal interpretation of Charlies Parkers quotes don’t always fit. While he did use extensions, the one concept that does hold true is that of the main structure of the melody line is the highest note. I do intend to take this article further and show examples from his repertoire. I do welcome contrary views or other interpretations in the comments. Ear Worm Music | Proudly Powered by WordPress.